over 150,000 patient visits in the past 10 years in Tibet. We focus on mother and child health. 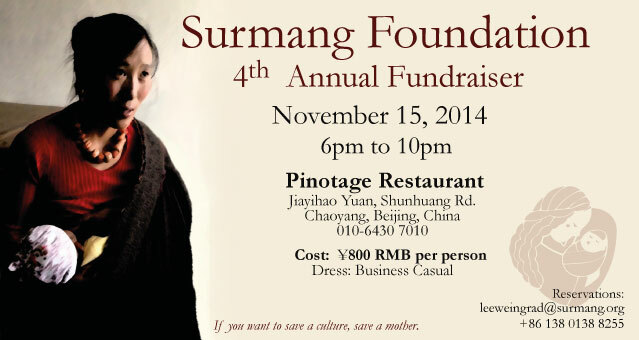 Surmang Foundation is located in Yushu prefecture, a place with highest maternal mortality and infant mortality rates in the world. The danger to a pregnant mother is over 3 times that of a US soldier in Afghanistan. Throughout the past decade, Surmang Foundation has operated its clinics and organized a cadre of local women to provide community-based care and education to women, resulting in a notable reduction in maternal mortality. Make a tax-deductible contribution through the highly credible donation platforms. You can see how a significant difference can be made. If you're a professional from medical, public health or development and willing to support on the projects, send us an email now!